Now, FREE shipping to anywhere in the United States! It's a very big book: 15" tall x 12" wide and weighs 8 lbs! Mangle Boards of Northern Europe is an unprecedented window into the world of mangle boards, wooden implements used from the 16th to 20th centuries for smoothing linen. Handcrafted, they reflect the work of both skilled carvers, trained in the classic styles of their times, and naïve carvers, unschooled in woodcarving and academic visual traditions. 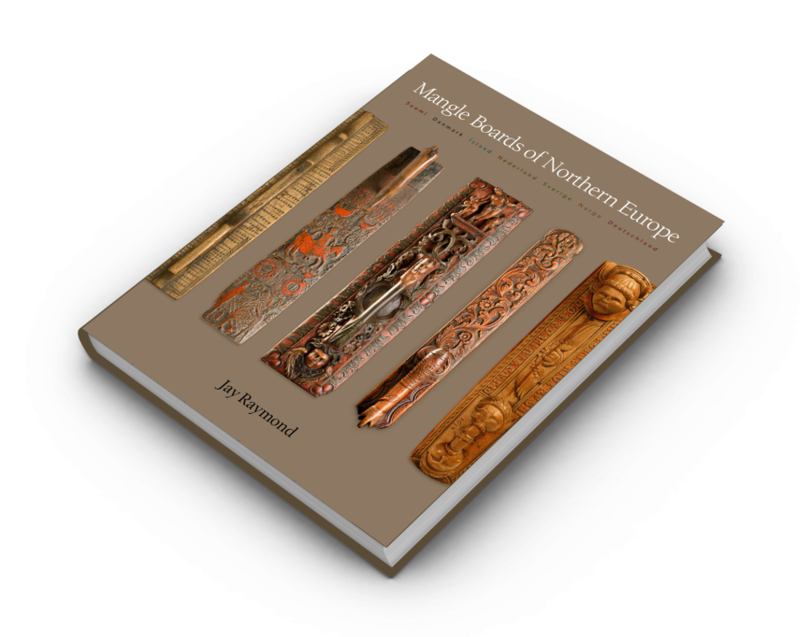 The 267 mangle boards in this book were drawn from national and regional museums in Iceland, Norway, Sweden, Finland, and Denmark; regional museums in Germany and the Netherlands; and private collections. Each museum or collection granted the author access to examine its mangle boards—a total of nearly 7,000. Author Jay Raymond closely studied the boards for their aesthetic characteristics. As a student and later a teacher at the Barnes Foundation in Merion, Pennsylvania, he acquired and practiced its disciplined approach to the study of art and art objects. Through his examination of the mangle boards, he established a set of visual characteristics common to those typical of each country. Raymond’s new and invaluable insights are described and illuminated in detail. The large format and photographs permit the beauty and sumptuous nature of the mangle boards to be indelibly impressed upon the reader, who will end the journey through this book with nuanced and keen appreciation for these works of folk art.